The Root of your tooth has canals, and these canals contain the nerve and tiny blood vessels (Called the Tooth Pulp) that nourishes and gives the sensitivity feeling for your teeth. Theses nerves can become infected for many reasons, and since they have a very limited ability to heal themselves, therefore, once they are infected, they should be taken out of the tooth and that Root Canals should be filled with a special materials to prevent the germs to pass through them and reach the Tooth Apex and causing more infection of the jaw’s bone which might lead to pain and swellings. • A deep cavity that reaches the centre of the tooth causing the pulp to die. • A traumatic injury to the tooth. • An extensive preparation (drilling) of the tooth and this may have been done to prepare the tooth for a crown (cap) or other large preparation for a restoration. The pulp may or may not abscess immediately in these cases. It may take years for a problem to develop. The infected pulp tissue may or may not be painful. It may or may not be visible on a dental radiograph. A tooth with this type of an abscess is not usually extracted because the infection can be treated with Root Canal therapy on the tooth. This routine procedure can save the tooth and enable you to avoid the harmful effects of tooth loss. Root Canal treatment is successful in more than 90% of the teeth in which the treatment is completed. 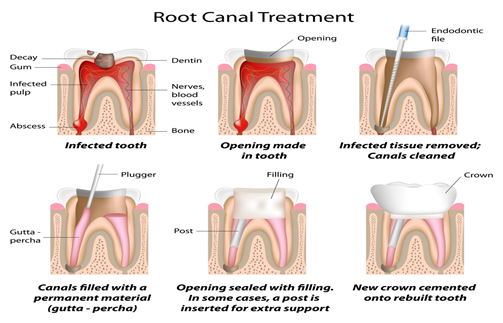 How Root Canal Therapy is Done? Endodontic treatment or Root Canal Therapy can take from one to three appointments to complete. Each single tooth may have one to four and sometimes five canals that need to be treated. What are the Three visits for? First Visit : An opening is created ( tooth access) to reach the nerve canal, and the dead nerve is removed from the root or roots, then the canal will be rinsed with special antibacterial materials, dried, dressed with special antibiotics and germ killers and sedative material, then the opening will be sealed by temporary filling. Second Visit : The canals’ length, where the nerves had been located, will be measured and then cleaned and shaped to make 100% sure that the whole nerves and germ’s toxins are removed from there, again a medication will be placed in the canal to promote better healing, the opening will be sealed by temporary filling. Third and Last Visit : When it has been determined that the canals are free of infection, they are filled with a special rubber-like material and sealed with a cementing medium. The abscessed area associated with the tooth will then begin to heal. It may take several months before healing is completed and for the tooth to become asymptomatic, that is, for any soreness in the area to disappear. Once the Root Canal therapy (endodontic therapy) has been completed, the tooth usually loses 50% of its strength, that is why we do recommend to restore the tooth with a cast crown. This is done to protect the tooth and prevent it from fracturing. Failure to follow through with mandatory restorative procedures after endodontic therapy on a previously uncrowned tooth can result in a vertical fracture. If there is very little tooth structure remaining, we may also advise the use of a post and core to further help the tooth retain its final restoration. We will discuss with you the exact type of restoration that you will need. Please note that this infection may cause discomfort between root canal appointments. This is normal and usually not a cause for any concern. Contact the office if there is pain and/or swelling. Remember to avoid biting down on the tooth until the root canal is completed and the final restoration has been placed. Put in your mind that you may have had no discomfort from the tooth prior to the root canal treatment or have been unaware that you even had an abscess. However, you may experience pain or swelling after the root canal treatment has begun. If we have prescribed antibiotics for the abscess, be sure to fill the prescription and take it until it is finished. It is important that you do this in order to quickly control the infection. If you do not take the prescribed medication, the resolution of the abscess may be delayed and problems with the postoperative pain are more likely. If you have any questions about the root canal procedure or the final restoration of the tooth, please feel free to ask us.